Yemen has endured three years of war. Saudi-led airstrikes and Houthi militancy have generated civilian death and famine. The UN Office for the Coordination of Humanitarian Affairs (OCHA) states that more than 10,000 Yemenis have died as a direct result of the conflict. Save the Children reported that 50,000 children died in 2017 alone. Three million individuals are internally displaced. More than 280,000 sought asylum in Djibouti and Somalia. According to the United Nations, the country is facing the worst humanitarian crisis in the world with 22 million lives in need of urgent humanitarian assistance. Amidst this growing crisis, Yemenis have been barred from entering the United States. In this exhibit, three artists portray life during the conflict in Yemen. Alex Potter’s haunting images of infrastructural destruction in the city of Sana’a represents “Death” – the state of absence. Not only are human lives lost but also centuries-old historical edifices. Thana Faroq’s pictures are representative of those who seek “life” amidst the chaos of conflict. Her images display children and women attempting to turn a blind eye to their surroundings, celebrating one another in the midst of ruin. Finally, Abubakr Al-Shamahi’s photos were taken during an anxious journey to Tai’zz, a city which is often forgotten in war reporting. His images represent the liminal state of living in a place where mass casualties have mounted. 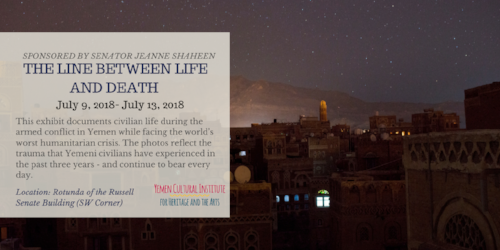 Collectively, their images reflect the ambiguities and struggles of existence on “the line between life and death” in Yemen. Alex Potter is an American photojournalist working mostly in the Middle East, beginning and most recently in Yemen. Her work explores conflict and trust, loss and isolation within communities and relationships. Alex aims to bridge the gap between the foreign and familiar by creating thought-provoking and emotional images. Thana Faroq is a Yemeni documentary photographer currently living in the Netherlands. In 2016 she was awarded Break the Silence scholarship to pursue M.A. in Documentary Photography and Photojournalism at the University of Westminster in London. Thana has collaborated with various international organizations and her work has featured in several prominent media outlets. Abubakr Al-Shamahi is a British-Yemeni freelance journalist. His photos from Yemen were taken while covering a story on the city of Ta’izz.